Ah Cinco de Mayo—the fifth of May. Today’s holiday is to commemorate the May 1862 battle when Mexico defeated the French at the Battle of Puebla. And many in the U.S. and around the world will celebrate this day with margaritas, Mexican-inspired dishes…and of course, parties. Shouldn’t your office partake in the festivities? If you want guests to attend your party, you have to invite them. This is especially important if your business doesn’t regularly hold office parties because workers may automatically assume no events are taking place. Be sure to save paper and e-vite workers to the office festivities. 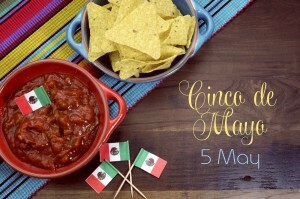 Microsoft Word has a range of Cinco de Mayo inspired templates you can use or creating an invitation on sites like Evite is quick and simple. A personalized fiesta invitation could be just the thing needed to get your party off to a great start. You can even roll it up and tie it with a fiesta bandana. Let your guests know that the bandanna must be worn in order to gain admittance into the party. And never forget the piñatas! We all know what type of dishes come with this holiday: enchiladas, fajitas, burritos and more. But, with an office celebration, it’s good to consider that you’re still at work. And once the party is over, many people may still have tasks to complete. Don’t send them back stuffed and wanting a half hour nap. Make sure your menu is filled with healthy Mexican dishes. SheKnows.com suggests serving food, such as tofu burritos, chicken tortilla soup and tostada bowl salad, as healthier options. Delish.com says you can pair the main dishes with healthy snacks, such as an avocado and orange salad, crab nachos, Tomato Salsa with Cucumber “Chips”, and chunky guacamole (be sure to serve baked tortilla chips with this and you can even put them in cite-sized cups). Chili Pepper Guessing Game: Fill a jar with a variety of different chili peppers (keep track of what kind and the heat level) and have each of the guests try to guess how many are in the jar. The guest with the closest estimate wins a prize (like a basket with fresh chips and homemade salsa). Mexican Dance: Hire a dance instructor to teach your guests a traditional Mexican or Latin-inspired dance like the samba, salsa, meringue, rumba, bachata or folklorico. And the final, and probably most important, must-have for your office celebration is to have fun! The point of preparing for an office party is to enjoy the festivity. Take a break from work, mingle with coworkers and let your hair down a bit. This Monday affords you the opportunity to actually have fun in the office; don’t let it pass you by.